After one ultrasound, four months of planning and execution, and a handful of reader death threats later, the time has come to finally reveal our daughter’s nursery! And then the ideas came. So as strange as it may sound, the nursery was inspired by this Old Navy tank top that I was wearing on that glorious day I discovered I was going to be a mother to a daughter. Close up of the tree–our favorite part of the room! I started with a beige-colored Neu Tree vinyl wall decal from Wall Slicks, and then added the colored leaves for a little more depth and interest. It pretty much took forever to hand-cut each of these colored leaves–but it was worth it! The curtain behind the glider hides the closet. As you can see, you have to step up to get into it (it’s located above the stairway), so it’s not the most ideal space. Because of that we’re only using the closet for longer-term storage and not things we need to access on a regular basis. I had G remove the door and I added this curtain so I could fit the glider in the corner and not have to worry about it being in the way of opening the door. The curtain hangs from hooks above the door frame, and a tie-back mounted inside the door frame holds it back when needed. Where the action happens! Since the closet isn’t easily accessible I wanted to make this a functional spot where we could easily access all the things we’d need on a daily basis. I refinished this large dresser (a hand-me-down from G’s boss Dave and his wife Julie) and it’s now filled to the brim with adorable little baby clothes. A Diaper Genie sits on the floor to the left of the dresser. The 2-drawered cube sitting on the dresser holds onesies, undershirts, and socks. The two baskets to the right of the changing pad hold diapers, wipes, lotion and hand sanitizer. I mounted some hooks on the wall to the left of the lamp which can hold pretty much anything–towels that need to dry, an extra blanket, the next day’s outfit, etc. I had my friend Steph (the brilliant talent behind Mada’s Place) make me the 3 hanging wall pocket organizers which I hung from a small curtain rod. They store all sorts of miscellaneous baby items and toiletries that will be nice to have close at hand. 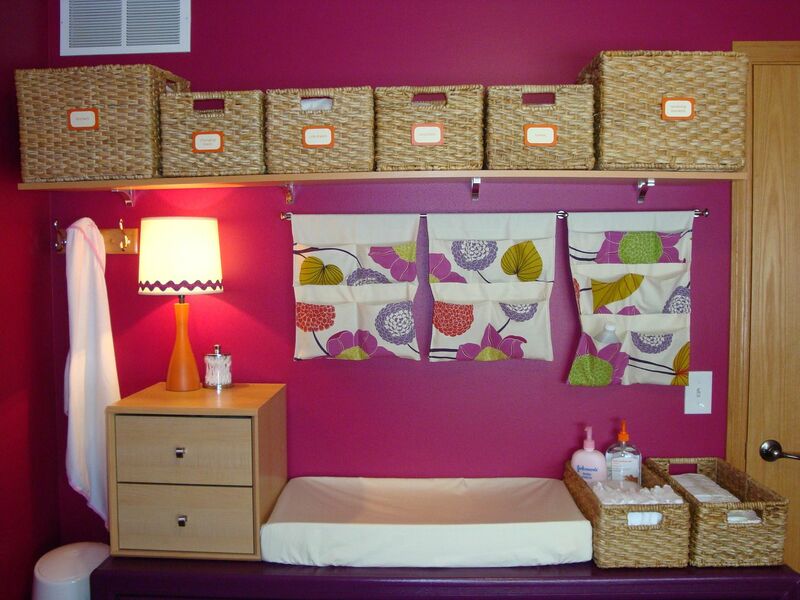 The baskets on the shelf hold baby blankets, changing table linens, crib sheets, swaddlers, and towels. The little bear is sitting in the crib in earlier shots, but his permanent home once our daughter arrives is this wooden highchair at the foot of the crib which was actually my highchair when I was a child. It needed a lot of TLC, but I refinished and repaired it and I’m happy to finally have a spot to display it. Update: CLICK HERE for Part 2 of this post which features loads of before and after pictures and more details on how I put this room together! I adore these color choices! Baby girl G & D will be so happy because she will be surrounded by so many stimulating colors. I get tired of seeing the other boring combinations out there now. Bravo! This is really original. I am in love with that tree – I really love the idea of a nature looking nursery and hope to do the same in ours. Very cute! I also love the idea of “building” your own changing station so that she can grow into it later. I’ve been reading your blog for almost a year now, I love it! But I really love the nursery…the colors are so different than what you typically see & a room that can grow with her! You two did a beautiful job, can’t wait to “meet” your precious little girl! I guess I was a little antsy yesterday :o). Love the nursery!! I already told you this, but I absolutely adore it! It’s so colorful and just so you. All I can say is wow! You have amazing style and vision. I love the nursery, the colors, textures, patterns…..Everything! Oh. My. Goodness. Soooo worth the wait to see – it is fabulous! Dusty, it’s gorgeous!! I love the colors and I love how you worked around the closet issue. Great job! So striking, bold and unique – I love it! Whew, I’ve been waiting (but patiently without any thoughts of death threat emails – although I’m not above it!). Fabulous job, D. Love that it was inspired from the tank top you wore the day of your big ultrasound, love the colors and the room as a whole. Perfect for your little girl. 1. I wish I was that organized when I had my first baby…who am I kidding, I wish I was that organized now. 2. Can you do my room next, it is so cozy in there! Love, Love, Love the nursery! Great Job! I actually got to meet Steph from Mada’s Place at a local craft show in Columbus. She is so great and does such great work. Wow. I wish I was that creative!! So beautiful!! D ~ the nursery is beautiful! I LOVE the tree! I love the nursery! You did an amazing job D! I love the fact that the room isn’t too “baby” and grow with her! I wish I had you decorating (and fashion) sense! Great job! Wow! I love it!! Great Job!!!! Too funny! Our nursery has bright walls and a tree as well! 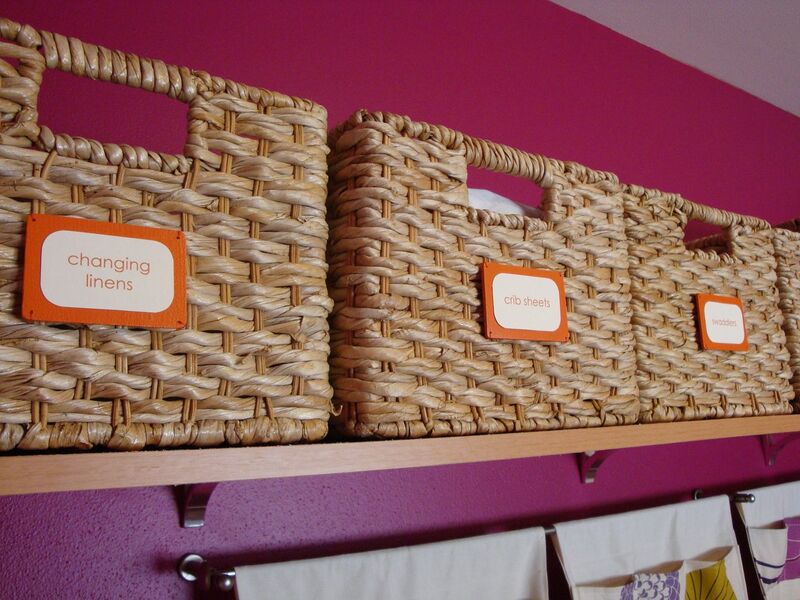 I do love the changing station and baskets–I wish that our room were big enough for something like that! I love it!!! My favorites are your highchair and the tree applique on the wall! I love it!!! I love that it’s not the typical baby girl nursery. Love the colors and DIY touches. great job! you never know where inspiration may come from i love the tree too! I literally gasped out of disappointment when I realized half of the pictures didn’t load… but I refreshed and now I can see them all… and it’s GORGEOUS! The wall color is so rich and amazing. A lot of people shy away from such a bold color on the walls, but it looks great! BTW, not sure if I’ve commented here before. I love your blog! Crazy as it sounds, we didn’t find out what we were having for our first one. For our next, I am SO finding out for the express purpose of such fabulous advance prep. What a beautiful nursery! I love how you used a shirt for inspiration, great use of color. SO cute! I love the colors you chose and I LOOOOOOVE the tree. What a lucky baby girl! WOW, WOW, WOW! What a beautiful nursery! it’s beautiful, dusty! love love love the colours! I love it! It’s girly without being twee. Clever idea on the curtain for the closet door, too! Oh wow! I’m filing this one away for inspiration… it’s beautiful!! love, love, LOVE THE TREE!!!!!! And I have to say, your crib looks almost identical to our crib (we had a girl too). Fabulous nursery. We’re having a boy in three months and he will share a room with his sister. I’m currently trying to think of ideas of how to make their room boy/girl/cute/neutral. It’s tough! It’s just right. You are going to enjoy spending time in there. Thanks so much for showing us…finally! Oh and I wanted to say that I LOVE that you have your old highchair in there. For me, that makes the room. Very nice D! Before I even saw any of the pictures, I knew which shirt you were talking about! LOL. I’m not the biggest fan of the pink, but I think the overall nuresery is great. I’m loving the changing area–very creative, very useful! My jaw is literally on the floor… you did amazing, although I’m not surprised one bit! Amazing…. Super cute! I love the colors you chose! Your storage solutions look great too! So great! 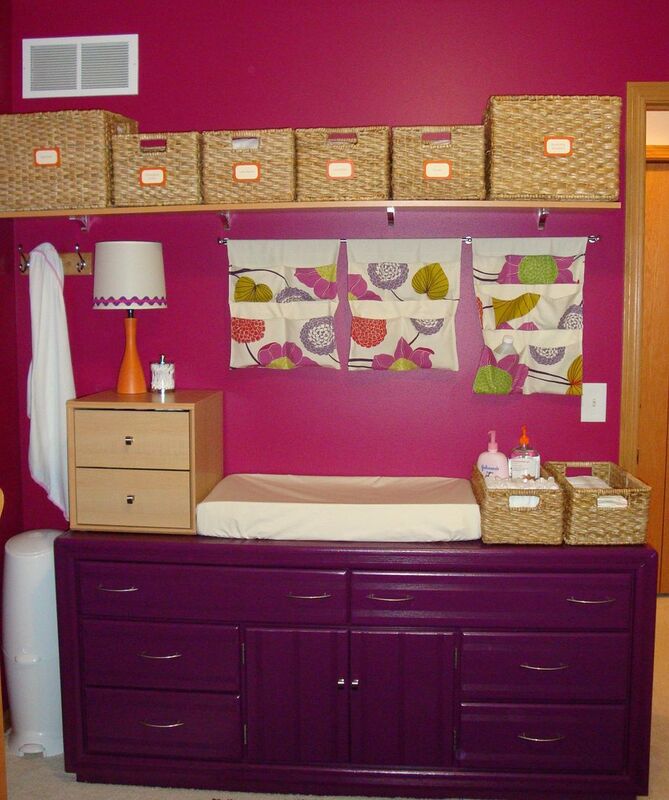 I’m due with baby #1 in a few months, so I’m loving all of your storage ideas. (We have a weird closet in our room too that I’ll need to work around.) Thanks! I LOVE IT!!! So worth the wait! 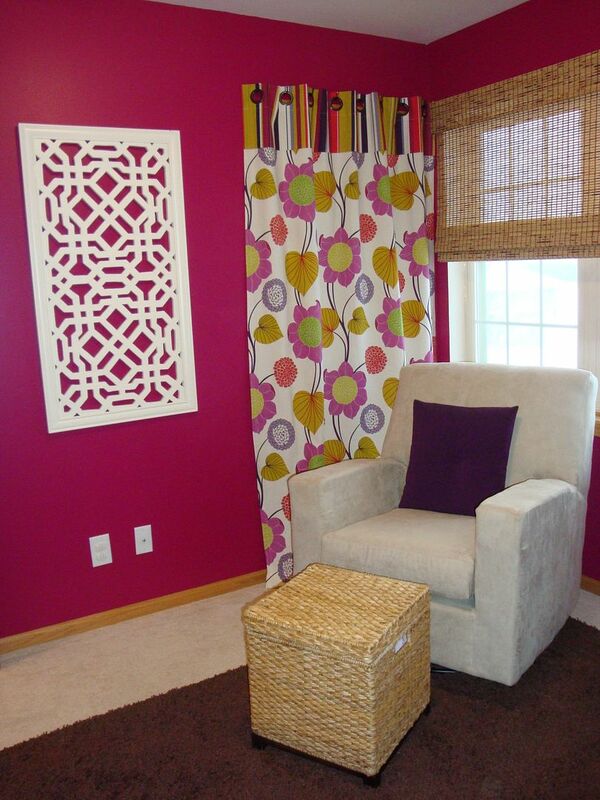 Where did you find the matching fabric for the curtain and the hanging storage? Amazing job! The room looks fabulous! OMG I LOVE it and the tank that inspired it. Can’t wait to see the transformation to the nursery as I’ve loved transformations to your other rooms. OMG, it’s freaking fantastic. Let it go on record that while I was, ummmm, anxious to see the nursery that I never threatened you. Serioiusly…….it is awesome Dusty. You do great work kiddo. I’m a longtime reader but this is the first time I’ve felt that I absolutely had to comment. This is the most unique nursery and I absolutely love the idea of being inspired by the shirt you were wearing when you found out you were having a girl! oh yeah – I can say that you are due in SIX DAYS! HOLY CRAPOLA. I am soooo excited for you! LOVE IT!!! It always amazes me how people come up with such wonderful colour combinations and how they get it mesh together so well. One talent I wish I had. What is the font you used on the baskets? Forgot to ask, where did you get the bamboo window cover? Fab!! I love the colors you chose. Oh, yeah……….about that step up closet, that will make THE. BEST. FORT. EVER. for the little munchkin!! Beautiful! I’ve been waiting forever to see this post! Can’t wait for the 2nd part! Good job! love, love, love!! Super cute and baby G&D is going to love it too! I love the colors, especially the wall color! I love the tree. I love it all. The nursery looks adorable! It’s so fun, but she can grow into it! Where did you get your glider? We’ll be getting ready to start planning for our (gender friendly b/c DH won’t find out!!) twin nursery and I love yours! Awesome. Not too theme-y and the colors…swoon! I love them!!! It’s GORGEOUS! I just found out that baby #2 is a girl and I am sooo excited!!! We already have a boy, so it’s fun to shop for a girl now and start our baby girl’s nursery. Thanks so much everyone! I’ve been so excited to share our daughter’s nursery with you all and am so flattered by all your wonderful comments. Thank you! I hope to have The Nursery: Part 2 post ready for publishing next week and will be sure to answer all your room-related questions there. Stay tuned! @Ashley–Your son’s room is adorable, thanks for sharing! And to answer your question, I surveyed my “mom friends” to get a good idea of what I’d need handy and went from there. @Meredith–I checked out your nursery as well, and it’s beautiful! 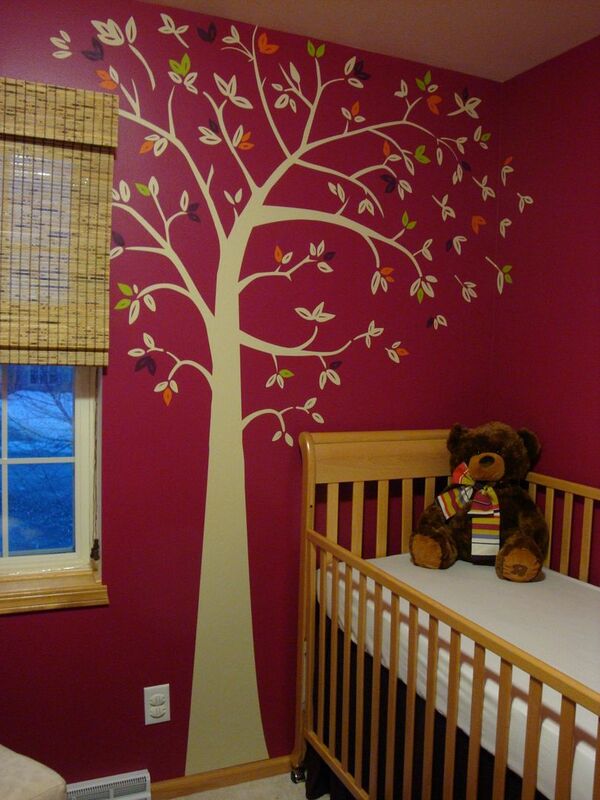 Love the hand-painted tree! @Amber–That’s so funny that you knew exactly which tank top I was talking about, lol! I love that! @jenni–Congrats on baby #2. One boy and one girl–how perfect! Love the bedding you picked out; very unique! As I expected, it’s beautiful! Great colors and great design! Fabulous! Beautiful! Definitely doesn’t look like any nursery I’ve ever seen – and I mean that in the best possible way. 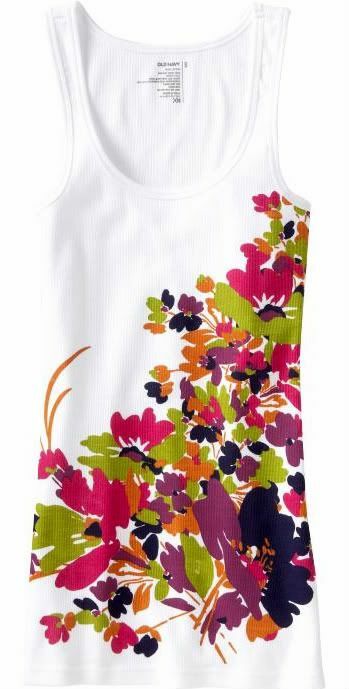 The color pallette is great, and the tank top makes great inspiration for any room. Well done! I actually came to the blog to see if Baby G&D was here yet – I am so excited for you! I love the colors and I love the decor. Absolutely stunning, D! You outdid yourself. Your baby girl is going to grow up in style. Love it and best of luck to you as the big day approaches! Would have never chosen that pink, but it’s perfect. And, the tree. Fabulous! just found your blog, and I am in love! we are building a new house and I am always looking for design ideas… yours are amazing, I will be using you for inspiration for sure! I was searching your archives for a nursery pic, and wondering why I couldn’t find any! It’s really cute, and totally different. One suggestion: get blackout curtains/shades, or darker window treatments… my son will not nap if it’s too light in his room, I had dark brown curtains, and had to get blackout shades for behind them. I spent a few weeks w/ blankets draped over the windows to block out light! This is GORGEOUS!!! I love that you’ve steered away from the traditional “baby” colors and themes and gone for something that can easily grow with your baby girl. Delurking to say that your nursery is absolutely beautiful!! Well, actually your entire decor in your house is absolutely beautiful!! You are very creative Excellent job on the nursery!! It is so beautiful! I love a bright, bold, punchy nursery. Now all you need is that beautiful baby to complete it! BRILLIANT! I love it all. We also did a tree in our room. It’s a cherry blossom. It’s in my blog too. LOVE IT!! Seriously, you need your own show on HGTV. Your little girl is going to start her life in STYLE. Fab!! that is an AMAZING nursery! i seriously showed this post to everyone i know saying – look how cute yet chic this room is! i definitely want style like you when it comes time for me to do a nursery! I can’t even tell you how much I LOVE this! So chic and fun! I really enjoy how organized you are too! Ah-mazing!!! @Nikki–Congrats on your new house; that’s so exciting! I have a black out shade for behind the bamboo shade, I just haven’t done it yet. I’ve heard it’s a lifesaver! @claire–Awww, that’s so sweet of you; thank you! The nursery is adorable and so fresh! I love it when people go with a more modern, design-forward aesthetic rather than plain ol’ baby pink. The tree is awesome and I would say well worth your effort. I also love the punchy orange on the high chair and the custom curtain rod accessory holder thingy (thingy is a technical term, right?). I have been absent from your blog for a while and was just thinking, “I think D’s due soon” and low and behold, I drop in today and today’s your due date. I hope she arrives soon; I’m sure you’re eager to meet her! i loved everything about the nursery, it has definitely inspired what i want to do for my little girl, from the closet solution to the storage to the tree! Hi Dusty, its lyradelmar from the Nest, I’m not on the boards as much as I use’t be but I do read your blog every now and then. First, I wanted to congratulate you and your husband on your beautiful baby girl, she’s lovely!!! Secondly, your nursery has to be hands down one of the most unique and absolutely gorgeous rooms I’ve ever seen. If you recall I am a lover of rich bold color, and you have created such an incredible, colorful room for your baby girl. Bravo! @pubeydooby–The baskets are from Target. @harp–Hi! I do remember you from The Nest. Thank you so much for your wonderful comment! I love your style. Been frequenting your blog for decorating ideas ever since I stumbled on it for tips on making an upholstered headboard. Getting really anxious for the more detail post on how you put this nursery together expecially to find out the name of the paint color! What a fun room! I love that you designed it after the tank top you were wearing when you found out you were pregnant ~ how cute! Mind sharing where you found the glider? Such a great nursery, lovely! Your baby girl is adorable! Hope you don’t mind I just blogged about the nursery? LOVE your nursery! We’re getting ready for one of our own – would you mind sharing what paint colors you used for the walls, dresser and tree? Thank you so much! D-this nursery is amazing! i love the colors! if you looked in my closet, you would find about 10 items that are that pink that’s on the wall. in fact, i’m wearing one of my berry colored shirts right now. i’m not a homeowner, parent, or artsy in anyway, but i totally love what you’ve done. Thanks so much everyone–all your wonderful comments have brought a huge smile to my face! In case any of you missed it, all your questions can be answered in this follow-up post: Kate’s Nursery: Part 2. If there’s anything I missed, feel free to ask. Thanks!